Woahink Lake is one of the Oregon Coast beautiful lakes offering you great water quality to swim in. Early in the year, this shallow coastal lake warms up quick. With good weather we may see water temperatures reaching into the 60s. 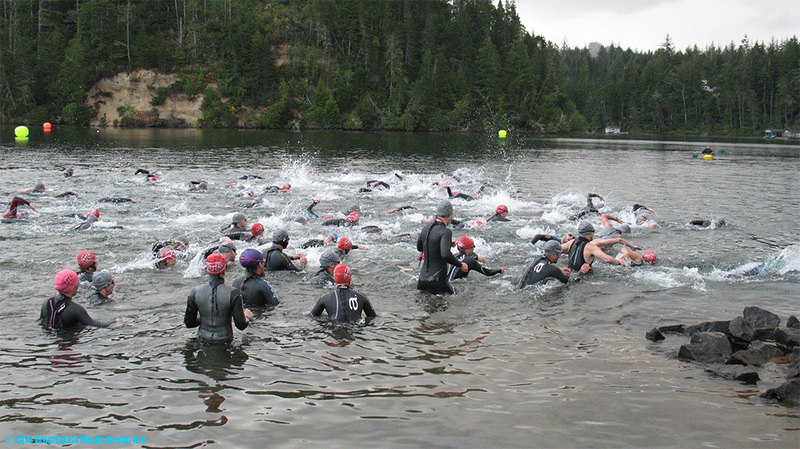 Wetsuits are highly recommended and may be required depending on weather conditions. The race starts at the East Woahink Lake boat ramp. 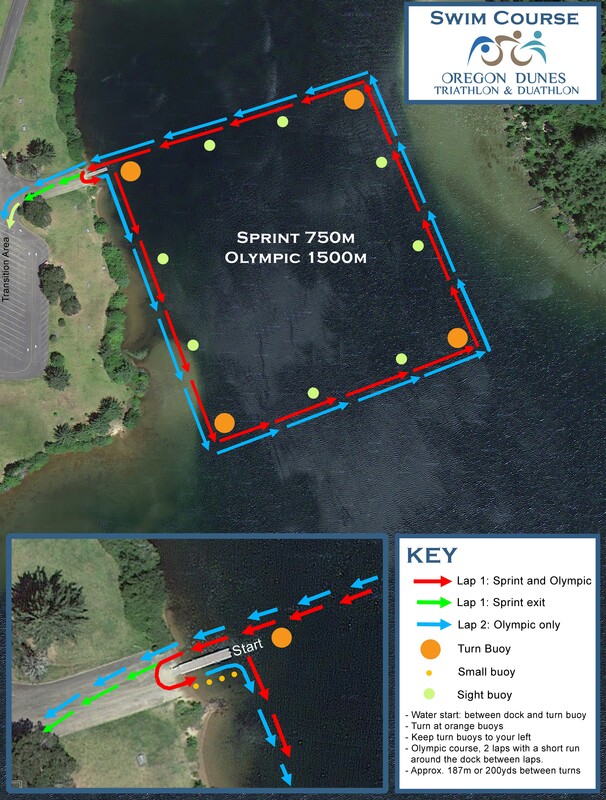 Swimmers will be sent off in waves with a standing in water start and will swim 2, counter clockwise loops. Keep all buoys on your left until you arrive back at the dock. Exit up the ramp and return to the water for loop 2. At your second return to the ramp, head up and into the transition area. As you leave the park you’ll head east and explore the scenic back roads and foothills of the coastal range. 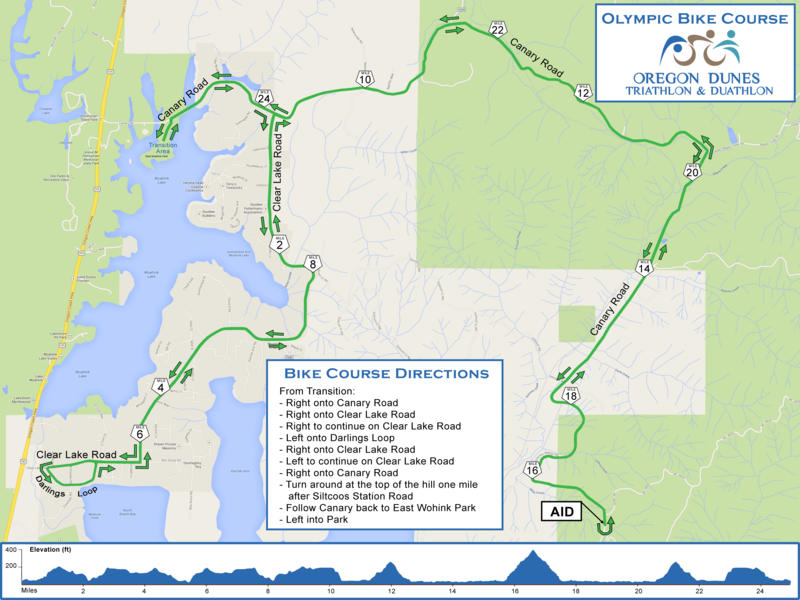 The Olympic bike follows the sprint course for the first 9 miles before heading to a second out and back section. This course includes rolling hills and great views. This course has 1723ft of elevation gain. Check out the bike course videos below! 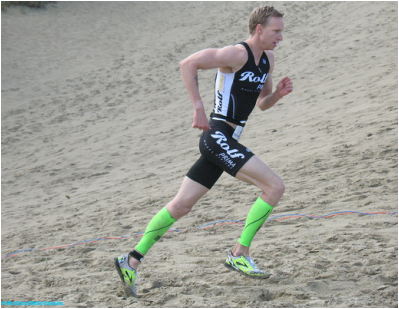 Duathlon starts here! Duathletes will be started in a time trial fashion on the bike when the first sprint triathlete exits the water, no later than 8:15am. Turn by turn directions are available on the bike map. You run begins with a cross county loop around East Woahink, before tucking into the trails of Honeyman State Park and weaving along the lakes and though the campground. Just after the 2 mile mark and the second aid station, you will take on a single track hill and head back to East Woahink. At transition, you will begin loop two. On your second loop at mile 5.4, you will head straight and cover the remaining 0.8 miles. A combination of grass, gravel and dirt trails, paved roads and even some sand make this a very fun two loop, point to point course. Just when you think you're done, it is time for the epic and iconic finish up the dune at Cleawox Lake. The view is worth it, we promise!